For other people named Brad Davis, see Brad Davis (disambiguation). 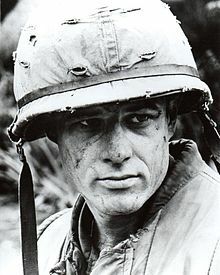 Robert Creel Davis (November 6, 1949 – September 8, 1991), known professionally as Brad Davis, was an American actor, known for starring in the 1978 film Midnight Express and the 1982 film Querelle. He was born in Tallahassee, Florida to Eugene Davis (a dentist whose career declined due to alcoholism) and his wife, Anne (née Creel) Davis. His brother Gene is also an actor. According to an article in The New York Times published in 1987, Davis suffered physical abuse and sexual abuse at the hands of both parents. As an adult, he was an alcoholic and an intravenous drug user before becoming sober in 1981. Davis was known as "Bobby" during his youth, but took Brad as his stage name in 1973. Davis attended and graduated from Titusville High School. At 16, after winning a music-talent contest, Davis worked at Theater Atlanta. He later moved to New York City and attended the American Academy of Dramatic Arts, and the American Place Theater where he studied acting. After a role on the soap opera How to Survive a Marriage, he performed in Off-Broadway plays. Davis married Susan Bluestein, an Emmy Award-winning casting director, 1976. They had one child, Alex, a musician. Diagnosed with HIV in 1985, Davis kept his condition a secret until shortly before his death at age 41, on September 8, 1991, in Los Angeles. It was revealed in a book proposal that Davis had written before his death that he had to keep his medical condition a secret in order to be able to continue to work and support his family. He is interred at Forest Lawn Memorial Park (Hollywood Hills). Later, his wife Susan revealed that he committed assisted suicide by a drug overdose. 1976 The American Parade Streetcar conductor Episode: "Song of Myself"
1976 The American Parade Thomas Nast Episode: "Stop Thief"
1977 Baretta Ray Episode: "Guns and Brothers"
1981 BBC2 Playhouse Young American Episode: "Mrs. Reinhardt"
1985 Robert Kennedy & His Times Robert F. Kennedy Episode: "#1.1"
1985 The New Alfred Hitchcock Presents Arthur Episode: "Arthur, or the Gigolo"
1986 The Twilight Zone Arthur Lewis Episode: "Button, Button"
1987 The Hitchhiker Jerry Rulac Episode: "Why Are You Here?" ^ a b c Witchel, Alex. (April 16, 1997) "For the Widow Of Brad Davis, Time Cannot Heal All the Wounds", The New York Times; accessed July 31, 2007. ^ Fox, David (1991-09-22). "How Much Does Hollywood Really Care About AIDS?". LA Times.